On November 29, 2014, the Volvo Ocean Race vessel Vestas Wind grounded “offshore in the middle of nowhere”. The experienced ocean navigator, with a master’s degree in physics, made a big mistake. As boaters, we rely on nautical charts and, frequently, electronic chart plotters to keep us safe and afloat. Yet these nautical charts have accuracy limits, and these limits are amplified when displayed on a chart plotter. This Tech Talk will discuss these accuracy limits and why they exist. We will discuss how an electronic chart plotter can make these limits more pronounced and how a chart plotter can be used incorrectly. This will help explain why the Vestas Wind grounding investigation concluded there were not only deficiencies in the use of electronic charts but also deficiencies in the charts themselves. We will show you some chart plotter errors that occur in places reasonably close to home; places which are visited frequently by boaters. Even more importantly, we will discuss how to avoid some common navigation mistakes which will help keep your boat off the rocks! 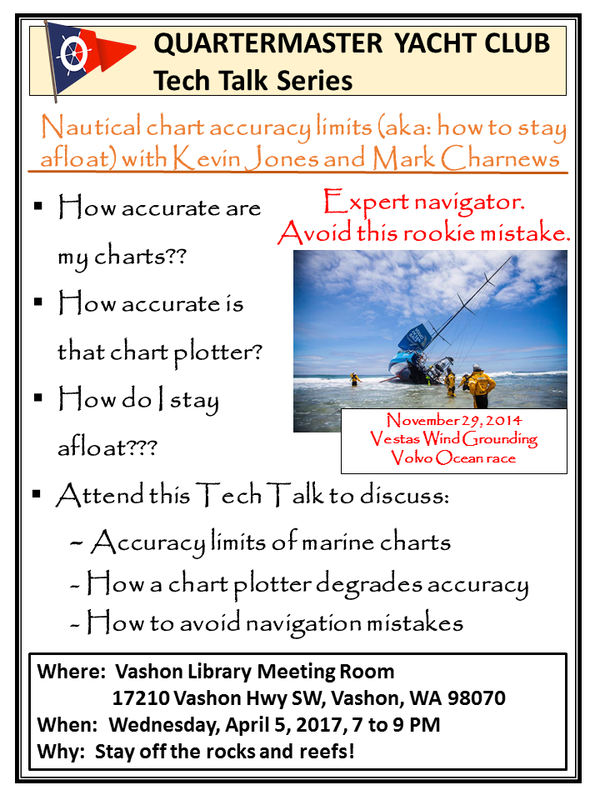 Bring your questions and experience to this interesting Tech Talk hosted by Kevin Jones and Mark Charnews on Wednesday, April 5 at 7PM in the Vashon Library meeting room.